Cut the lemons in half. Scoop out the insides. Add the lemonade to a saucepan and sprinkle the gelatin over the juice. Let it sit for 2 minutes. Heat the lemonade over low heat, stirring, until the gelatin has dissolved, about 5 minutes. Stir in the vodka. Strain vodka mixture to remove any solids (pulp, etc. ), and pour into the lemon halves. Cut each lemon half into thirds and serve. Balance lemon halves (open side facing up) in muffin tins to hold them upright in the fridge while the gelatin sets. Two things your summer needs: lemonade and jello shots. Kill two birds with one stone with pink lemonade jello shots. They require four ingredients which screams party-ready. 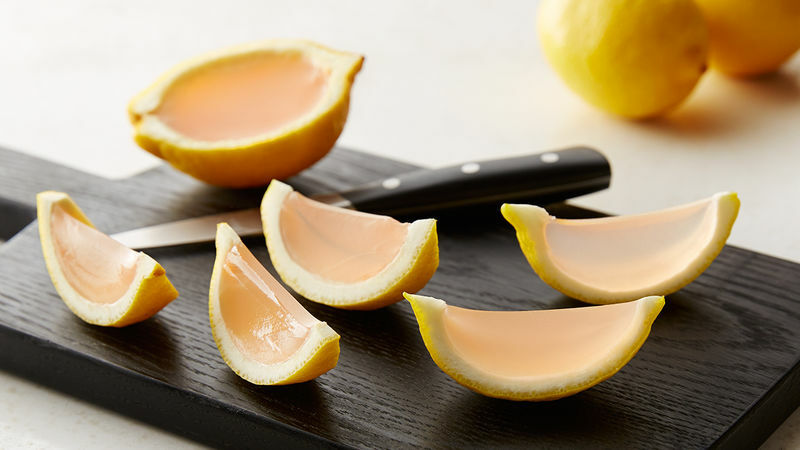 Sure, you could serve these summer shots in small plastic cups like everyone else, or you could serve them straight out of the lemon for both party presentation and flavor. The (party) trick for this recipe is to keep the lemon halves right side up while the gelatin sets in the fridge. One way you can do this is to set the lemon halves in muffin tins which will help balance the lemons. If you’re going all out for the party, you’ll probably want to serve more than one flavor of jello shots. Click here to learn how to make basic jello shots or Click here for every single jello shot recipe you and your party will ever need.